You'll be £10.99 closer to your next £10.00 credit when you purchase Barnsley's Best. What's this? Order within the next 7 hours, 3 minutes to get your order processed the next working day! When people think of a World Cup manager from Barnsley, Mick McCarthy instantly springs to mind for his exploits with Ireland. But did you know one man from the town took a country to the semi-finals long before McCarthy had even kicked a ball. 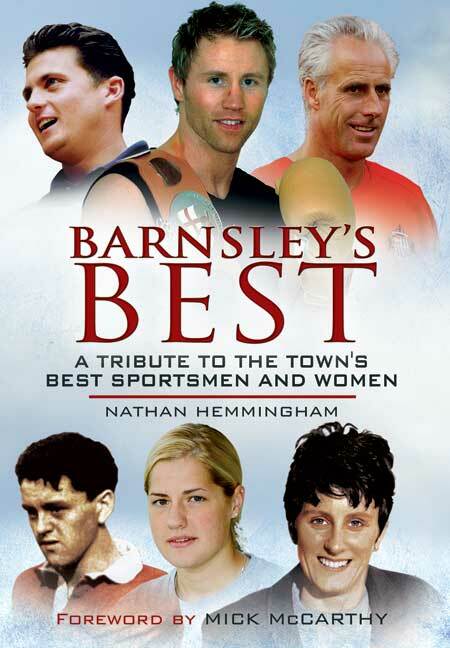 Barnsley's Best pays tribute to the those who have flown the flag on the biggest stage and, not content with just focussing on facts and figures, the book also captures the highs and lows in a heart-warming, fascinating look at the town's sporting heroes. More than 30 men and women are featured in the most definitive sporting guide yet. So, how did a girl from Cudworth become the fastest woman on the planet? How did a boy from Monk Bretton make it into English cricket folklore? And just how much does Mick McCarthy want to become manager of Barnsley FC? Nathan Hemmingham was once assistant sports editor at The Barnsley Chronicle, where he worked for seven years. During this time he followed the successes of the town's sports stars closely, and has a keen interest in Barnsley's sporting triumphs. Barnsley in South Yorkshire is known for many things and in particular for it's sporting heritage. Barnsley Football Club, Mick McCarthy, Dickie Bird and Darren Gough all spring to mind when thinking about sport in Barnsley, however there are many hidden gems that never get the media attention that they deserve. Who knew that Dodworth can boast a cricket world cup winner? Or that the world's fastest woman hails from Cudworth? This is an intriguing read to anybody from the town and will give you a huge sense of pride that some many sporting stars come from Barnsley (putting many big cities to shame!) and fly the flag for the town in the sporting world. Written by ex-Barnsley Chronicle sports editor Nathan Hemmingham, this is a must read for any sports fanatics from Barnsley and beyond. When people think of Barnsley, many think of it's coal-mining past, and many more fail to pay tribute to the town's unsung sport stars, not giving them the recognition they deserve. Listed within this book however, is a real tribute to the town's sportsmen and women and their stories of how they rose to the top of their game and become some of the leading players of their generation. The book covers a wide range of sports from football and England's national sport, cricket, to table tennis, martial arts and even weight lifting. There is also a chapter on Ones to Watch, which looks at future up and coming sport stars. With a forward by Barnsley lad, Mick McCarthy, the book gives an emotional and personal insight into the highs and lows of each sporting great. The book is also filled with interesting trivia, for example did you know that Gloria Goldsborough, for 21 years was the fastest woman on the planet? Or that Barnsley had a hidden gem who took Sweden to the World Cup semi-finals before Mick McCarthy kicked a football? Sporting greats of the town featured within the book include: Mick McCarthy, Tommy Taylor, Darren Gough, Arnie Sidebottom Dickie Bird, Sam Ellis, Angela Thorp, Billy Thompson, James Kirton, Craig Burke, Brian Stones, and many more. This neat little book, with its touching account of each star, is the ultimate guide to those from Barnsley who have achieved, and who have the potential to achieve sporting excellence. Barnsley's rich sporting history has remained one of the country's best kept secrets - until now. With a foreword by the first Barnsley sportsman who may spring to mind, international footballer and manager Mick McCarthy, Nathan Hemmingham has collated the stories and successes of sporting heroes from the area. From traditional sports like cricket and football, to more unusual pastimes like martial arts, this collection features, eight Olympians, two Paralympians and five international footballers to name but a few, as well as a section on our future champions. He provides insight into how their personal and emotional experiences have shaped their careers, and celebrates their achievements in a moving series of tales that will make you proud to be from this great region. Something to impress family and friends, and a series of involving stories to enjoy in their own right, this unique publication will appeal to anyone from Barnsley, or with a passion for the untold stories of our country's great sporting history. This book is for anyone who lives in Barnsley, likes sport and is proud of their heritage. Wrote around the question, 'what makes a professional sportsman/woman reach the very top of their game?' This book answers that question using fabulous accounts of those that did just that. There is a forward given by Mick McCarthy and an account of his journey to the top in the first chapter. Not only does this book included those more notoriously know such as Dickie Bird and Darren Gough , it also accounts for those often forgot or those that are unknown. For example, Susan Gilroy, 'Queen of The Table' who accomplishments are extensive and far reaching in her filed of table tennis. Being wheel chair bound, Susan has won the national championships fifteen times, however this is just one of her achievements, Susan's account is inspirational and surprising. This book is a real shocker for those that do not know their Barnsley born sporting stars and is a really enjoyable read. This book has the appeal to anyone wanting sporting fame for themselves and for those that are interested in local history. A really good book that will install Barnsley pride into anyone that reads it, young and old!